From being part of the response team during the flood event to inspecting our flood defences and identifying repairs, we’ve been very busy in the months since the devastating flooding caused by Storm Desmond. I’ve been spending a significant amount of time in Kendal, where around 2,000 properties were affected, in an Asset Performance team covering South Cumbria. We’ve finished all the emergency repair works across flood-affected areas but we still have a large programme of repair work to complete by autumn. The emergency works in Kendal included removing approximately 20,000 tonnes of gravel from key locations through the town centre. We would normally do this in the summer, when river levels are at their lowest. However, as the flood waters receded it was clear that a significant amount of gravel had been washed down through the town centre, which we had to remove as it can increase the risk of flooding once it reaches a certain level. Gravel removal is just one method of reducing flooding and we will be looking at a wide range of options in the future. 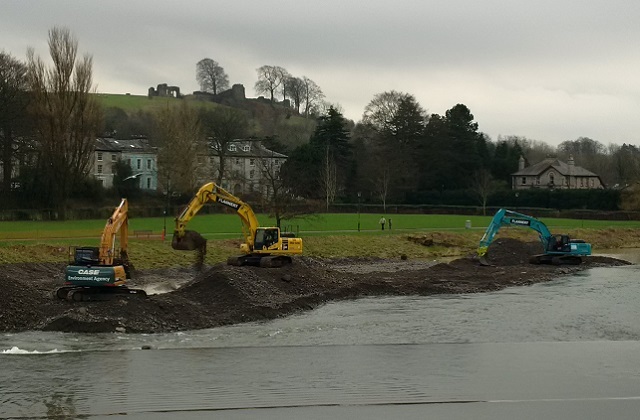 After Storm Desmond, we inspected all our flood defences and other flood protection to identify any significant deterioration and are carrying out emergency repairs where necessary, such as on the River Mint in Kendal. Although we’d planned some repair work here for the summer, we brought it forward because high flows of water meant the condition of the embankment was deteriorating rapidly. At the moment, we are creating a safe access ramp into the channel, replacing block stone and reinstating the pitching (stone face of embankment). A temporary defence has been on site in the meantime. 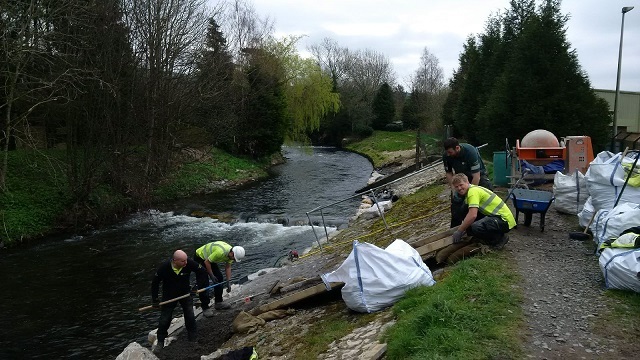 We always make sure that we plan maintenance and repair work carefully to ensure the work is carried out safely, given the risks of working so closely to potentially deep and fast flowing water. As well as planning and delivering repair work, part of my role involves attending one of the many post-flood drop in sessions we have hosted in flood-hit communities. Discussing and explaining some of the work that we do, and why we do it, is really rewarding. I found hearing from residents who had been flooded first-hand really helped me understand what had happened and what they had been through. no throw lines or life jackets visible for working within 2m of the river? I love that there is a River Mint in Kendal! It appear there is no silt mitigation measures being used, is this not a permit requirement? It would be nice to see pictures if there are?